I love when yarn shops have a local yarn section. When I’m traveling, I like to buy local yarn as my souvenir and having a dedicated section is very helpful. 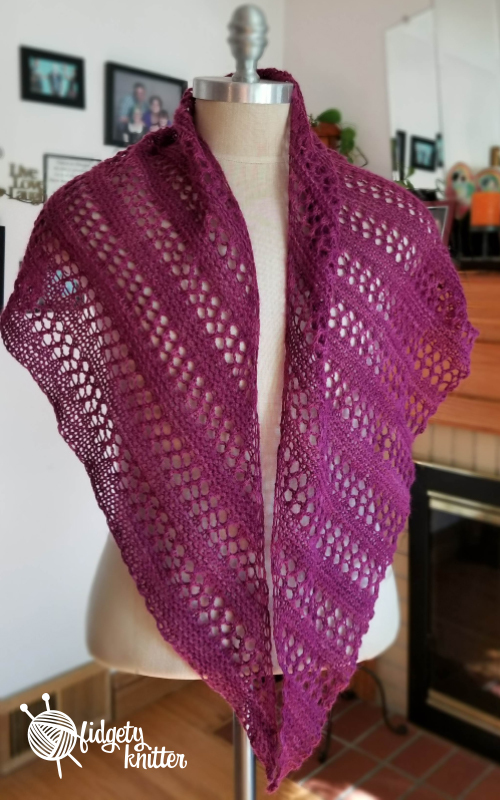 I also love to support local business owners and when my favorite independent yarn shop creates a section of local yarns, I will most certainly buy from there. Buying this particular yarn was a no brainer. This yarn is from Little Gidding Farm in Lester Prairie, Minnesota. So far, I am beyond impressed with this company. First, the yarn shop owner said they were lovely people. I think how you treat your vendors says so much about a company, especially when it’s a one- or two-person shop who doesn’t have the buying power of an elite boutique or Michael’s Craft Store. Second, this yarn is just fantastic. Clearly, with over half the yarn being alpaca, it is so soft and fluffy. It didn’t split while I knit and the color is just beautiful. My pictures are close for this wine-colored yarn, but there is a depth in it that comes from not being exactly the same color throughout. Some places it’s a bit lighter, some a bit darker. You can see this depth best in the top picture where the yarn is wrapped around itself (or when I hold it bunched up from shoving it in my bag). I’m so happy that I did not use this yarn for socks that would be super soft but completely invisible. 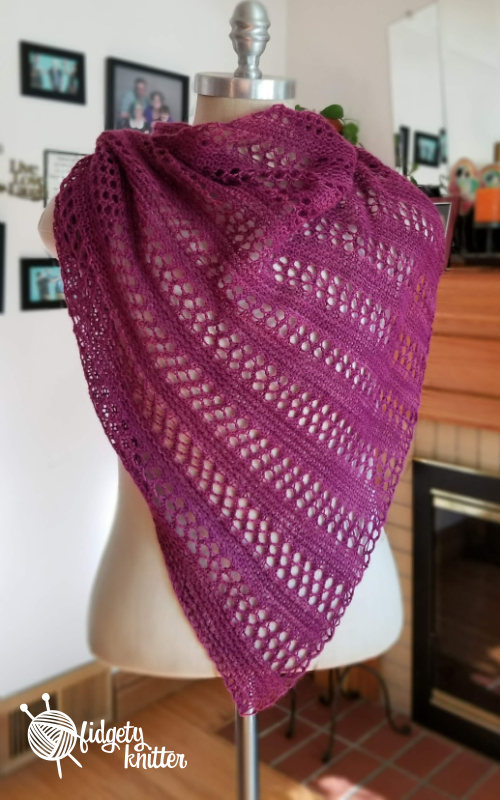 The pattern is Stormy Sky Shawl. This is an easy, interesting pattern. That I barely followed. Take a look at that beautiful photo on the pattern page It’s big. It’s lacy. It has tassels. Mine… does not. I knew it would be smaller as I only had one skein of this yarn (remember, sock quantity), but as I began working the pattern I remembered that I absolutely loath a yarn over twice that you drop on the next row. 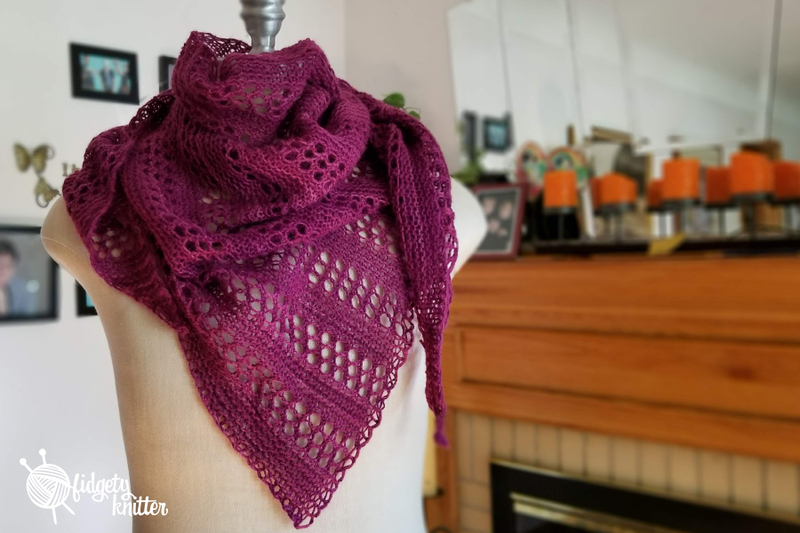 This pattern has four sections that are repeated over for the body of the shawl so I decided to just drop the yarn over twice section and one of the garter sections. In this version of the pattern you see the single yarn over repeat with one of the garter sections. I had to fake it about half the time at the end of each yarn over row. Because the number of stitches increased different, sometimes the pattern (and where it wanted the last yarn over) required a little… ad libbing. This isn’t something new to me as the same thing happened when I added yarn overs to my last Hitchhiker. And to be honest, I was sloppy with this project and didn’t go back to fix my errors. I’ve left mistakes in projects before, but these were, um, big ones. One section I shorted a yarn over row, in another, I had too-few garter rows and in yet another, I forgot the knit one before a yarn over row and the holes line up incorrectly (you can see those in the photo below). Once blocked, this shawl was exactly what I wanted. It’s light. It’s soft. It’s large enough to wrap around my neck or wear over my shoulders/arms. But it’s thin enough to not be bulky when I wear it to the overly-air conditioned venues in Minnesota during August. This shawl is the perfect all-weather wrap. Per the washing directions on the tag, I could lightly have brushed the shawl while blocking to raise a “furry surface.” I don’t have a brush in my house that would work for that (no brushing curly hair!) but I’m thinking a halo will rise up as I wear it (and shove it in my bag). *Slip the first stitch as if to purl holding yarn at the front of work. I didn’t do this because I haven’t liked how slipping the first stitch felt as I knit. However, I recently did this on a project I’m working on right now and wish I HAD done this as it would have created a beautiful edge. What beautiful thing have you finished that didn’t follow the pattern but you love anyway? Let me know in the comments and make sure to include links!